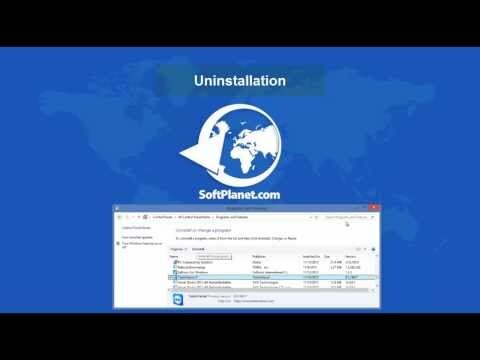 SoftPlanet makes it possible for everyone to get free TeamViewer download directly from our servers. There is no registration needed for downloading. 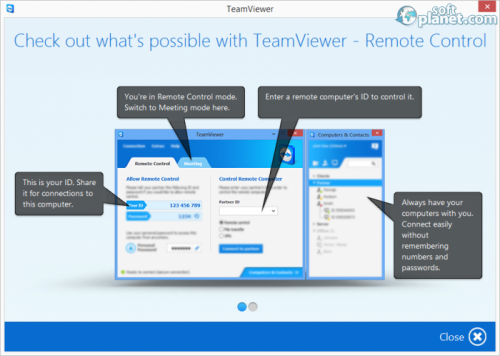 The TeamViewer company provides us with an excellent free for download software, with which any user can take control form his PC to any remote computer. As long as both sides has the app installed – it does not require superb tech skills to be run form either side. TeamViewer v10.0.41459 is free for download and it is also very helpful to anyone, who simply wants to fix a problem on his buddy's computer, to have access to the PC at the office or to set routine business meetings for small or big companies. Moreover, this app allows the users much more functions, than regular PC to PC connection. It is a perfect solution to communicate with large group of people armed with powerful tools. The Features of the TeamViewer are too many to be listed, but the main ones are: remote support, screen sharing, file transferring, two way users control, voice, video, VoIP and chat communication, ability to record the sessions and more. It works behind firewall and NAT proxy. Remote print and meeting add-in for Outlook are available as well. Superior help support is available with one click for any technical information. English is the only one language supported by this program. More licenses, than the free one, can be purchased and activated later to be achieved complete functionality. 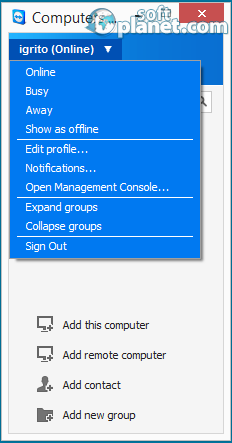 TeamViewer main panel has only three menus and two tabs. Almost every single component of the software can be enabled/disabled or customized from the options menu. Computers and Contacts panel provides information about all the registered PCs without needing for their names and passwords to be remembered. That way, setting-up an instant meeting is very easy and fast. 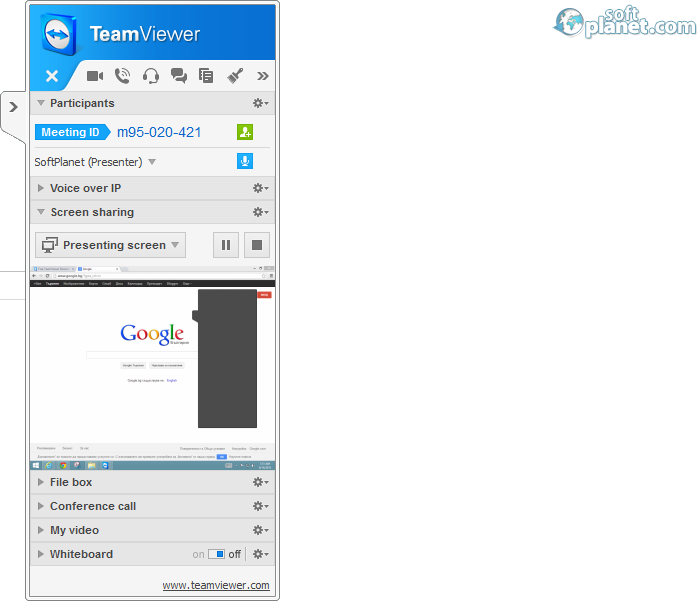 The meeting panel can be minimized during a conference call. During a session, the presenting screen can be customized to allow or disallow which windows/ folders to be shared. Also a whiteboard with a pen, highlighter, eraser and text balloon comes on hand to the meeting participants. They can be controlled from any meeting participant if his rights are granted. When a connection is established and the participants have joined to the scheduled meeting, the Presenter is the “godfather”. Hi is the person who has full control to all the users and their rights. He can mute anyone, allow audio, video, chat or file sharing only to particular members of the meeting. For example sometimes there are things which have to be shared only between few of the all meeting people. The entire session can be recorded and later to be used for further discussions or to be sent to a person(s) who were unable to present to that particular session. TeamViewer 10.0.41459 is a benchmark for a remote access software application. It is probably the best among all other similar programs. TeamViewer has raised the bar very high and it is unlikely some other app to reach the same level or let alone to transcend it. Our security scan shows that TeamViewer is clean from viruses. The current version of TeamViewer has been scanned by our system, which contains 46 different anti-virus algorithms. That ensures that TeamViewer 10.0.41459 is 100% safe for your computer.